There are many sides to Israel, most of which you can’t fully appreciate from a distance. From ancient historical sites and religious shrines to sparkling beachfront resorts and stylish modern architecture, you really have to feel Israel in order to understand it. This comprehensive journey captures it all, from Tel Aviv to the Sea of Galilee, from Jerusalem to the most southerly reaches, providing an ideal blend of past and present. It begins in Tel Aviv, Israel’s cosmopolitan Mediterranean port, where you’ll explore the historic port of Jaffa, witness the Bauhaus-inspired architecture of Neve Tzedek and the UNESCO-protected “White City,” visit Rabin Square, and learn about the history of the Jewish diaspora at the Museum of the Jewish People, all with a private guide. Later, head north to Tiberias, Israel’s beloved resort town on the Sea of Galilee, stopping to explore the ancient ruins of Caesarea (once the capital of the Roman province of Judaea), the holy Mount Carmel, the stunning Bahai Gardens, the UNESCO-protected remains of Acre, and the limestone grottos of Rosh Hanikra along the way. In Tiberias, you’ll retrace the early years of Jesus in Sepphoris, purported to be the birthplace of Mary, tour the Church of St. Anne, visit the Basilica of the Annunciation, and see the Church of the First Miracle, where Jesus turned water into wine. 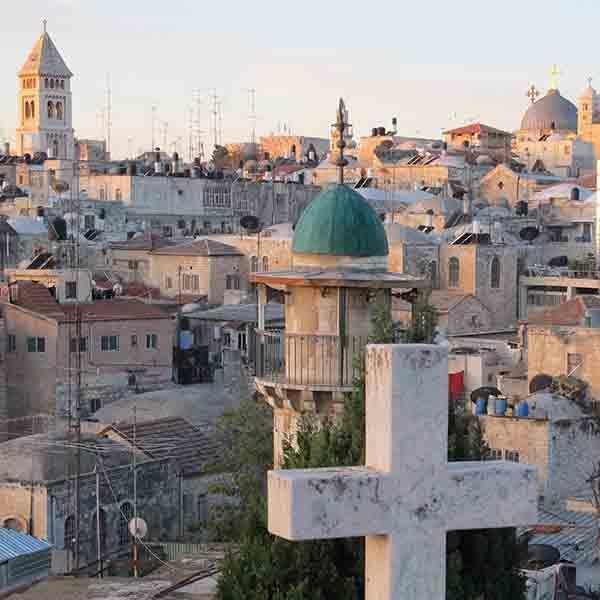 Next, skirt the West Bank en route to Jerusalem, where you’ll explore the holy sites of its Old City, walk the Via Dolorosa, tour the Christian and Jewish quarters, and encounter the Western Wall, Judaism’s most sacred site. Later, explore Jerusalem’s fascinating New City on a private tour that takes in landmarks like the Knesset, the Israel Museum (home of the Dead Sea Scrolls), the Yad Vashem Holocaust memorial, and other important sites. Before departing Jerusalem, you’ll also have the chance to explore the legendary mountaintop fortress of Masada and take a dip in the Dead Sea before returning to Tel Aviv en route to Eilat, Israel’s southernmost port. There, you’ll take a private tour of the fascinating rock-cut city of Petra in Jordan and have time to soak up some sun on the Gulf of Aqaba’s golden beaches before returning home.